A word on context. I have noticed among comments posted by various segments of “the Right” or “liberal Left” alike that all too often their anger is expressed in imprecise comparisons with forms of government that were specific to the interwar period. These political types cannot be transferred to current-day American politics willy-nilly. It is a crime against the truth. Communism was not supposed to happen in a backward country (Russia), but the Bolshevik coup, taking advantage of the military situation on the Eastern Front in 1917 (see http://en.wikipedia.org/wiki/Treaty_of_Brest-Litovsk, especially “Background”), amazed the world as 1/6 of the land mass of planet Earth would now advertise itself as a “workers’ state.” Its early phase celebrated modernity and was believed by its adherents to be the fulfillment of the Enlightenment and the liberation of the individual. As a result American writers and intellectuals were excited by the Soviet vanguard, and many were won over to some form of radicalism, especially after the Great Depression hit the U.S., in spite of the socialist realist protocols administered to Soviet artists and fellow travelers in the 1930s. (See http://en.wikipedia.org/wiki/Socialist_Realism, also http://en.wikipedia.org/wiki/Zhdanov_Doctrine.) 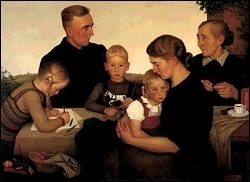 Socialist realism and Nazi art both idealized the People. Notwithstanding the twists and turns of the Comintern line, the Soviet Union prided itself on its freedom from racialism and all forms of nationalism/imperialism, lauding in its place “proletarian internationalism.” There were supporters of both Lenin and Woodrow Wilson in the post-WW1 period. The Republican Party lopped off its radical branch during Reconstruction, thence to be the party of industry and finance. Because Popular Front Communists insisted that the Republican Party was composed of Nazis, in contrast to their ultra-democratic selves (the “true” anti-fascists, e.g. the Abraham Lincoln Battalion), Democrats and CP fellow travelers alike have fastened that hateful term (Nazis) on Republicans (and Trotskyists, the anti-Stalinist Left). Even so, Progressivism was bipartisan in nature, with many Republicans (e.g. the Theodore Roosevelt administration) supporting a “new nationalism” with a safety net, support for unions, and a “living Constitution.” But more pertinent to today’s Republicans is the move of “socially responsible capitalists” switching to Keynesian economics in 1942, as they formed the Committee For Economic Development and bolstered the ranks of progressivism (see https://clarespark.com/2010/06/19/committee-for-economic-development-and-its-sociologists/). 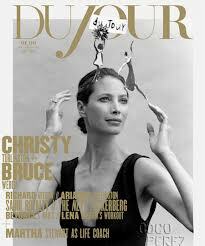 The Democratic Party thus became the party of a certain kind of rich person, who ostentatiously show their love for “the Common Man,”while simultaneously shopping with Saudi Royals and perusing luxury magazines such as Du Jour (illustrated above). The frugal housewife went out, while the revolt against “Puritanism” flourished in both mass culture and high culture. What has happened to our political culture? Can we no longer inform the public that there is an entirely different strategy for wealth creation in the Democratic and Republican parties as currently constituted; that Keynesian economics are different from supply-side economics, and should be calmly described without cursing out the opposition? For a related essay by Ron Radosh in dialogue with David Dreier, see http://hnn.us/articles/how-left-wing-look-americas-heroes-reveals-its-own-ignorance?utm_source=HNN+Newsletter&utm_campaign=39c2ec2f9b-Roundup_Top_10_8_31_128_30_2012&utm_medium=email.